After two rounds of matches, of largely uninspiring football, in Group F of Italia 90 there was nothing to separate any of the four teams from each other. Four draws, each team having conceded one goal, and scored one goal meant that Group F was the tightest group in World Cup history. It was a group that would go on the make world Cup history. Ireland's final group was against the then current European champions, the Netherlands. The Dutch had beaten Ireland at Euro 88 on the way to winning that tournament by playing outstanding football and scoring some great goals. While the Dutch had not set this tournament alight with their performances to date the team was loaded with such talents as Ruud Gullit, Marco van Basten, Frank Rijkaard, and Ronald Koeman. The match was a fascinating match-up between a team of talented aristocrats of football and the long ball Jack Charlton football style of the Irish team. Although the Irish football manager's tactics were crude they were implemented by some talented players in the Irish team. As in the opening match against England the Irish started slowly and fell behind to an early goal from Ruud Gullit. From the centre circle Ronald Koeman played the ball forward to Gullit who attacked the Irish defence. He played a one-two with Vim Kieft on the edge of the 18 yard box and although he was forced wide he still managed to coolly slot home beyond the despairing Pat Bonner. With just ten minutes gone the Irish were 1-0 down and looking decidedly rocky under the pressure exerted by the Dutch team. It was looking like it might be a hard day at the the office for Charlton's men. The Dutch continued to threaten the Irish goal for the rest of the half but Ireland remained composed and resolute and they made it to half time just one goal in arrears. The second half began with Ireland intensifying the pressure on the Dutch and disrupting their rhythm. As in the earlier English match the Irish struck back just after 70 minutes. A typical long ball from goalkeeper Packie Bonner was dropping down on the edge of the Dutch 18 yard box. In an effort to prevent Tony Cascarino latching on to the ball PSV Eindhoven's Berry van Aerle played an attempted cushioned volley back towards his own goal. 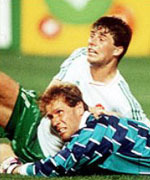 Dutch keeper Hans van Breukelen scrambled across the goal to gather the ball. Fortunately for the Irish van Breukelen spilled the ball in front of the advancing Niall Quinn who slid in and scooped the ball into the empty net. The match was all square. Soon after this the players on the pitch were made aware that England were leading in their match against Egypt through a Mark Wright goal. If both matches ended as they were the three European teams would go through at the expense of Egypt. If either Ireland or Holland lost then the loser would be heading home from Italia 90. It was in both team's interest not to risk losing. While there has never been any hard evidence to prove it, it appeared at the time that both teams colluded not to threaten each other's goal with the teams taking turns to play passing non-attacking passages of play until the final whistle. England had broken the deadlock in Group F by beating Egypt. This meant that England progressed in the World Cup as group winners. Last placed Egypt headed home. Ireland and Holland would both progress but they could not be separated as they had identical records. For the first time in World Cup history the finishing positions in a group were decided by drawing lots. The Irish were drawn in second place and the Dutch were drawn in third place and progressed to the knockout stages as one of the best third place finishers. The draw was hugely significance as Ireland avoided West Germany (the ultimate winners of Italia 90) in the next round. While the task ahead would not be easy by any means Irish football manager Jack Charlton was somewhat relieved to be drawn against Romania in the last 16. Republic of Ireland: Packie Bonner, Chris Morris, Steve Staunton, Mick McCarthy (capt), Kevin Moran, Paul McGrath, Ray Houghton, Kevin Sheedy (Ronnie Whelan 63'), Andy Townsend, John Aldridge (Tony Cascarino 63'), Niall Quinn.